In my search to find a way of writing-practicing that would take me more into a introspective-phenomenological space equivalent of the integral calculus blogging process, I came across work on clean space. (H/t to my buddy Ian Johnson for the links). I’m still just skimming the surface of a whole mess of these related ideas (see here for more). This is a psychotherapeudic practice that works with the mental landscape, the metaphoric realm of inner space. David Grove, the original thinker behind all this, described (in part) this work on clean space as “psychoactive” which is exactly the same term Ken Wilber uses for his integral map. [I think they mean slightly different but closely related imo things by the terms]. When I started reading some of these posts, I get the sense more and more that this is something I need to look at and is very close to (if not perhaps exactly) what I’ve been looking for in terms of a more first person walk through the perspectives. I’m still thinking of a way to connect this with this style of writing I’m exploring. Clean Space basically works with the mental landscape (metaphoric) that we create and then walks individuals through that landscape, speaking from the position of that space. So there’s first a general first person mode (entering one’s subjectivity) which is metaphorized in locational vectors (3rd person of the 1st) which one can then enter and speak from (1st person of the 3rd person within 1st person) as well as dialoging between the various spaces (2nd person of the 3rd person space within the 1st person domain). I want to see if I can walk myself through such a practice and then transcribe in a sense (or maybe write simultaneously??) the spaces and the experience, the locations/metaphoric landscape, as well as the points of view taken up. I want to make clear yet again (on a broader point) that this form of integral thought that I’m working with (Ken Wilber, Steve McIntosh, Mark Edwards, et.al) is only one form of integral. Any openings, as Heidegger would say, are also closings. They uncover and yet conceal. Revelation is both an opening and a concealing. Same with this trajectory. It reveals a great deal (imo) but also conceals other pieces. It deals mostly with metaphors of space in the interior and exterior world: e.g. Kosmic Addresses, world-views, worldspaces, etc. It helps explain, gives voice to an amazing amount of various dimensions of existence. And others it leaves out. The nature of that process needs always to be kept in mind. To move first to perspectives is already to occlude other potential ways of writing-thinking-experiencing-feeling. As I’ve said on multiple occasions, I think the best (supplementary/complementary/alternative) view of integral is this one. Basically that tradition states that integral is an already formed living tradition of fullness which needs to be revived/re-lived in any day and age. Either of the artistic canon side (as the link previous) or say in a spiritual perennial sense. I think eventually one has to deal with society, values (implicit and explicit), worldviews/ethics, and all the rest at which point the more integral as new stage of development (integral crew #1) I think comes into play. But the fact that I focus in one direction (predominantly the first tradition) does not mean I think the other one is not without a great deal of truth. I’m only doing that–focusing in a specific line. In one that I feel I have something to offer that is more unique. But again it doesn’t mean I don’t keep in mind the other tradition. My lived insights into that first strain of integral philosophy (the theory-praxis strain) is very fluid and has been deeply expanding of my attention, care, understanding of the world without and within. But it is only one way. I have for a long time wished I could do more to combine both streams of integral, but at this point I feel more the need to enter into the one I feel most at home and where I can be most creative, contribute the most. And in the interim, just periodically remininding folks that it is only one strain within a larger series of strains. In my on-going reflection on what I should do with this here blog I’ve changed the subtitle to “intelligent sounding nonsense.” That line is cribbed from here. I’m guessing its author meant it in a different way than I’m taking it, and just so it’s clear I’m not doing this to re-start some beef between us. I actually think non-sense is the direction more and more I need to go–to becomes less sensical, less practical. Sensical and practical in the common usage. I’ve been thinking for awhile now of how exactly to capture it in a pithy phrase and lo! the Universe responds. Part paradox, part social criticism, part self-mocking. I find what is generally understood in the blogoic-sphere as sensical and practical to not have much relevance for me. Plus the stuff really worth reading on the blogsophere is already out there. I don’t have much to add by way of that conversation anyhow. Or anything to add by way of practical creative originality. I suppose here and there I can just link to things of value (according to what I think is valuable that is) and I might do some of that here and there. The old subtitle of the blog was Christianity, Integral Philosophy, and Politics. The Christianity stuff has largely (though not entirely) migrated over to my blogging at Credo @ Culture11. Politics is something I find I have less and less to say (maybe it’s less of a need to say?) and might just link here and there as I feel. Probably won’t be able to completely rid myself of some commenting but I expect that to be decreasing in amount. Plus the Skypecast Dialogues with Scott are far more interesting and fun way of discussing politics than straight blog posts. So that leaves Integral Philosophy. I’m not sure if what I do constitutes real philosophy. My background is in history so when I came to study philosophy it generally has been more through a history of philosophy stance. Also I’m only working with one strand or really one camp within Integral (e.g. Wilber, Edwards, McIntosh). A camp that in some fashion or other emphasizes development, worldviews, quadrants, premodern-modern-postmodern-integral sequencing, the integral cycle, etc. 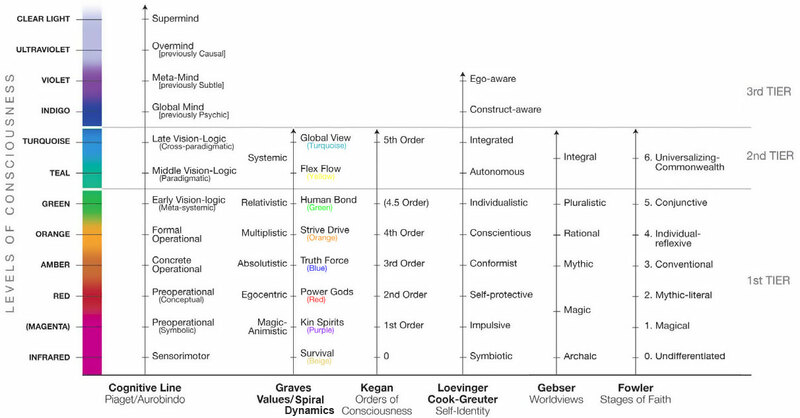 That version of integral (in its various sub-formulations) does very well with things like evolutionary components, the interface between technology-economics and ideology, patterns of large scale political-organizational formation, the brain-mind problem, aligining traditional spiritual maps of consciousness with modern science and postmodern hermeneutics and so forth. There are a number of other issues on which it’s not well suited (or helpful). More than a theory of everything it is as Mark Edwards says a theory for anything. Except it’s really not [which is ok :)]. I’ve never been a huge fan of the language around integral being the most comprehensive and so forth–at least as comprehensive is normally understood as piling on, bigger, more stuff. Most comprehensive as in Whitehead’s understanding of com-prehension now that’s another story for another day. That being said, I have a bit of history doing commentary on various works in integral-land. I might continue every so often with one of those. But I really want more and more to investigate and experiment with this notion of a perspectival glossary. In Wilber’s book Integral Spirituality he only does a brief introduction on the concept of the integral/perspectival glossary (what he calls a Giga-Glossary) the few examples he gievs are all nouns. Would verbs or adjectives work? Diderot & Crew in the founding of modernity in The Enlightenment had The Encyclopedia. Derrida had his Glas-sary as one of the key texts of postmodernity. So it makes sense, but how exactly to proceed? My buddy Joe Perez used to do a series of posts called Holons of the Day (for what a holon is here). He would post a photo of something he felt of value. By affixing the holon label it had a way of subtly shifting the photo into a new lens (at least for me). What I’m thinking about doing here would be something like that except more in the realm of writing. In other words, nonsense. The notion (via Wilber) of returning philosophy to perspectives–and the Glossary as a way of categorizing terms in light of that philosophical shift–is something like a meta-archaeology. (This version of) integral thought as Wilber says is (essentially) content-less as it deals with the quasi-universal existential structures (of development through lines, of states, 1-2-3 modes of being, the four dimensions of any arising moment, and the self system). I’m here dealing more with the tone of thought, the tone of thinking, more than anything else. Understanding the same stuff in a different light (to switch my metaphors). These three regulative principles–nonexclusion, enfoldment, enactment–are principles that were reverse engineered, if you will, from the fact that numerous different and seemingly “conflicting” paradigms are already being competently practiced all over the world; and thus the question is not, and never has been, which is right and which is wrong, but how can all of them already be arising in a Kosmos? These three principles are some of the items that need to be already operating in the universe in order for so many paradigms to already be arising, and the only really interesting question is how can all of those extraordinary practices already be arising in any universe? In fact, as Ricoeur points out what is communicated publicly in conversation & dialogue is never my inner personal experience but rather the public meaning of that experience. So even Wilber’s point is that you and don’t have to have the exact same experience/worldspace when reading his quotation (though the three strands still apply–take up the practice, i.e. read the thing, the event/meaning is disclosed [if you get it], and whether you get it is checked via discourse with the knowledge community]. All that has to happen is we have a more or less similar (mutually recognizably so) sets of intuitions/experiences regarding the above. If philosophy is a meditation on being-in-the-world, I find this attitude one of grace. There is a deep relaxation involved in: A)seeing that much of what we initially term as conflict is really underneath sign of relative health (people are clueing in to their own experience, already in practice, if unconscious in large measure) which means we don’t have to enforce some one truth on all beings and B)not needing to have the “exact same experience” and fretting over the exact nature of the exact nature but rather focusing more space and attention to learn to articulate clearly and listen attentively and find creative ways of interacting with both our similar (roughly) worldspaces and the differences, different qualities/nuances we each feel/experience within them.